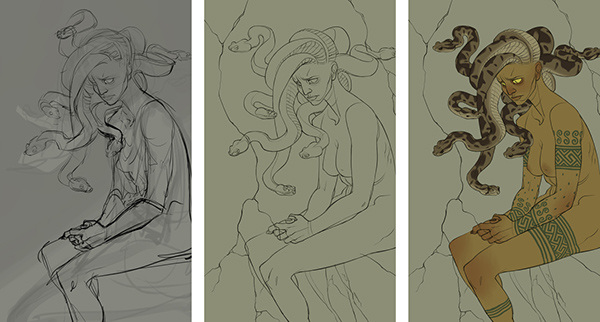 Perseus process and development, 2015. Drawn for the 2015 Cosmos Exhibition at Light Grey Art Lab. Perseus is hardly a great guy, and this is made abundantly clear in his killing of Medusa – a woman violated by a god, and who was cursed and ostracized as a result. I enjoy any retelling that flips Perseus' narrative away from Medusa being an undeniable monster, and rather someone unwillingly dragged into the petty dealings of higher beings. I wanted to capture the moment of sadness before her death – she knows Perseus is there, she knows there's nothing she can do. Not resigned, but exhausted. 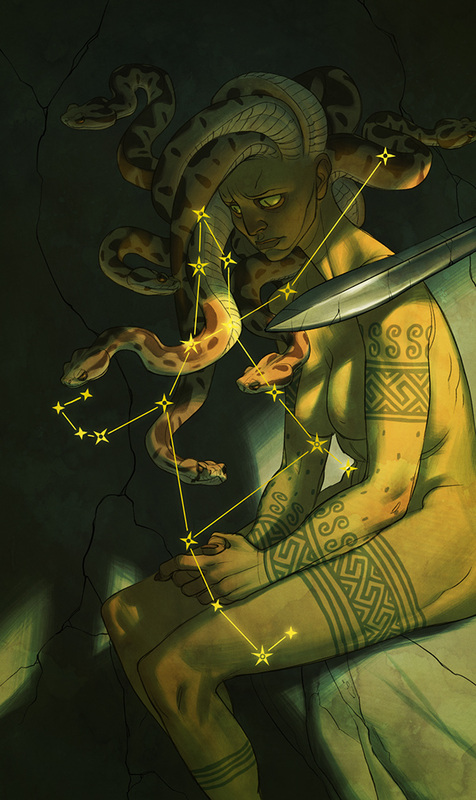 Illustration of the constellation "Perseus" for the 2015 Cosmos show at Light Grey Art Lab.